Aerobic exercise in the swim spa offers benefits for your heart health second to none. Swimming's movement expands your heart, pumping blood more efficiently. makes your heart larger and pump blood more efficiently. Heart disease is the #1 killer in the United States, and there are few better ways to prevent heart disease than in the swim spa on a regular basis. Swimming at an aerobic-level heart rate increases stroke volume, allowing the heart to put forth less effort to deliver blood to vital organs. A healthier cardivascular system allows your heart to easily change size and build stroke volume. Increasing your heart rate through aerobic exercise in the swim spa builds the number of capillaries in your muscles at work, reducing plaque and helping with artery elasticity. A healthy system increases blood flow to target muscles. Aerobic exercise leads to greater enzyme production, converting your digested food into energy cells. Mitochondria production increases, improving aerobic capacity (faster swimming). Risk for chronic disease lowers when your cardiovacular system pumps blood more efficiently and produces more energy. Increased production in good cholestorol results from aerobic swimming, lowering risk of a heart attack and maintaining your blood pressure/vessel function. Healthier cardiovacular systems improve body temperature regulation as well. Strokes in the swim spa work your lungs and heart, training your body to use oxygen more efficiently. Your breathing rate and resting heart rate decreases. Need we go further? Now is the time to take advantage of better heart health with an Endless Pools Fitness Systems swim spa. 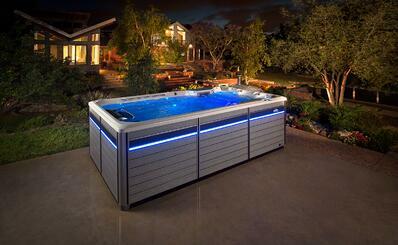 For more information ,go to Endless Pools Fitness Systems. *Dean Michael Ornish is an American physician, and president and founder of the nonprofit Preventive Medicine Research Institute in Sausalito, California, as well as Clinical Professor of Medicine at the University of California, San Francisco.